The Ganden Monastery has a rich Buddhist history. It was built in 1409 by the celebrated Buddhist leader Tasongkhopa and majestically sits on a mountain slope. It includes two Buddhist religious colleges and extensive dormitories for the resident monks. Ganden Monastery once housed thousands of monks. Today the count is several hundred. 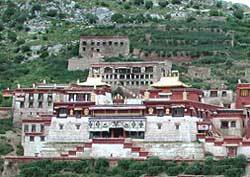 Ganden Monastery has been largely restored after having been severely damaged. The restoration work continues. The main assembly hall is the main draw of the sprawling Ganden Monastery. The room is supported by over a hundred columns and is large enough to accommodate several thousand chanting monks. They include The tomb of Tasongkhopa (in Serdung college) and the Ngam Cho Khang chapel (Tasongkhopa supposedly taught his disciples in this room). The Ganden Monastery also has some notable murals and sculptures.